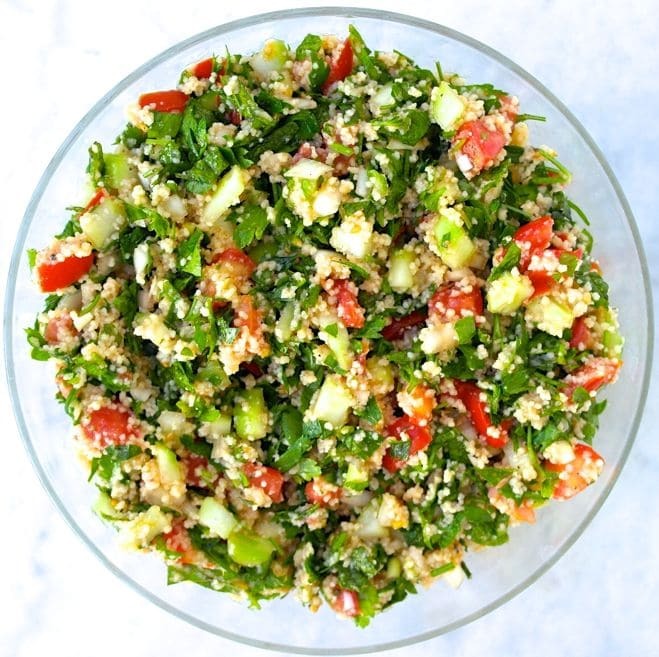 Tabbouleh is such a great salad. 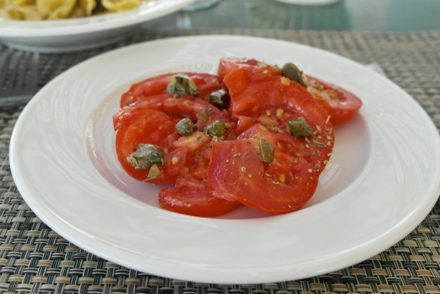 It combines all the classic ingredients of the Mediterranean: tomatoes, cucumbers. herbs (parsley, mint), olive oil and lemon. While it is not a Greek dish, it definitely combines ingredients common in the Greek cuisine and I love it! So there are many different versions of Tabbouleh, I tend to like the one with more parsley and less bulgur. The original recipe uses bulgur (in Greek we call it pligouri) a cereal made from the kernels of wheat, which maintains much of its bran and therefore is a good source of fiber, but sometimes couscous is used instead, although I much more prefer it with bulgur- healthier and tastier. The nutritional value of this dish needs no explaining, but I’ll go ahead just in case. First of all this salad (as most salads) is a great source of fiber, which means it keeps you full for a long time. This salad is full of antioxidants from the tomato, onion, olive oil, parsley and lemon. 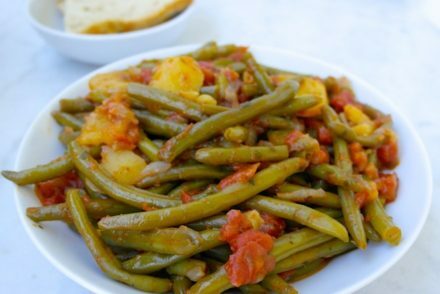 Also as this salad has some starch in it, it can make up a whole meal that is satisfying and filling. This salad is a bit deceptive, you may think it is light, but actually it is very filling and hearty. I actually ate only this salad for lunch and dinner the other day and I was very full. Also this salad tastes much better when it sits overnight, not only do all the flavors meld together, but it softens the herbs and the onion. 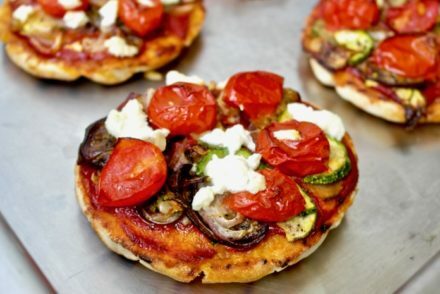 I followed a recipe given to me by my former colleague and the friend at the American College of Greece, Deree, Sophie Themelis, a personal trainer, pilates and yoga instructor with a Greek, Jordanian and Palestinian background. Thank you Sophie! Stir bulgur, salt, boiling water & let stand for 15 minutes. Drain excess water. Chop the tomatoes, cucumbers, parsley, mint, onion and mix well in a large bowl. Add the bulgur and mix well. Add the dry mint, salt, pepper, olive oil and lemon and mix well. Sophie recommends to mix with your hands, and I agree, as it is a common way of really making sure all the ingredients are thoroughly mixed together. Cover the bowl and let it sit for at least 2-3 hours, although overnight is better. Serve as a side dish or as main course. This looks wonderful, I love to eat this salad. Did you make it with flat leaf parsley? I have always used the curly leaf type, I don’t know if that makes a difference to the taste. I have tried growing parsley and the curly leaf refuses to grow for me but I have a young flat leaf plant that looks promising. I would like to be able to make this salad without an extra trip to the store. We have several types of mint that are growing like crazy, even where nothing should survive! Thanks r.a. Yes, I used flat leaf parsley which is the most common here in Greece. I have not used curly leaf, is the texture a bit rougher? I usually add a bit of cumin and/or cinnamon, plus some fresh garlic paste (http://www.finecooking.com/article/mashing-garlic-to-a-paste), and fresh mint. Indeed, the best salad ever, especially with burgul. Yes, the texture of the curly leaf parsley is rougher. I will try this with flat leaf parsley. Flatleaf is much nicer, but if you only have the curly, don’t hesitate to use it; just chop it very fine. Bulghur is much more nutritous than couscous, which is actually a tiny pasta. Not a bsd food (especially wholewheat couscous) but not as much fibre as bulghur. Could I replace chopped chick peas for the bulgar? You could, but it would result in a different (still healthy) salad as bulgur is a main ingredient for this salad.